One major struggle maintenance groups seem to be dealing with today is a growing preventive maintenance (PM) backlog. Over time, some PMs fail to be closed, and work begins to pile up, resulting in large amounts of non-critical work being put on the back burner. Although the task of minimizing or eliminating backlogs can seem daunting at times, there are ways to address this problem while still taking a proactive mindset toward your equipment. In most plants, many failure-​related issues tend to be repeat events. Identifying, addressing and resolving these known and recurring failures or defects in the field will lead to reduced maintenance costs and minimal equipment downtime. This strategy is known as defect elimination. In the defect elimination process, counteractive measures are developed to minimize failures that are similar in nature. This method often takes place directly after installation of the equipment, but it also offers value at locations where the equipment has been functioning for years. 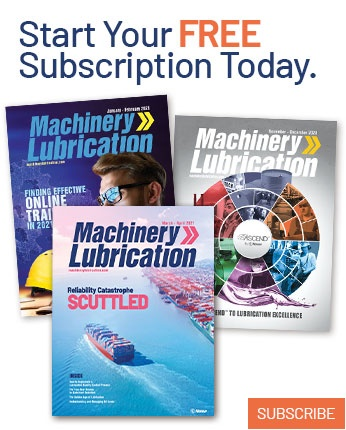 While this practice is typically thought of as only replacing actual components, all aspects of the asset should be considered, including lubrication. Lubrication defect failures can be broken down into three primary modes: particle contamination, temperature and moisture. 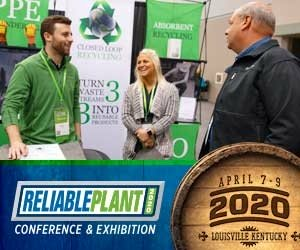 By clearly understanding these issues and the requirements for improving each failure mode, you can help to minimize the repeat offenders. In regard to lubrication, particle contamination can be described as any dirt (silica), metal, soot or soft insoluble material that is not designed to be present but which gains access to the lubrication system. It has the potential to damage the lubricant and the component’s lubricating surfaces. As particle contaminants find their way into a lubricant, they begin to cause different types of wear and drastically affect the additive depletion rate. Wear can occur on the lubricating surface through mechanical wear, chemical wear or surface fatigue. Mechanical wear happens through a variety of different mechanisms. Adhesive mechanical wear, also known as galling, scuffing or seizing, takes place in heavily loaded, sliding-contact locations where poor lubrication is evident. It is most common to see this type of wear with cylinders, gear contacts, rolling-element bearings and cam followers. Three-body abrasive mechanical wear occurs when a particle becomes lodged between two lubricating surfaces, leading to cutting, gouging and plowing of the component’s surface. This type of wear is most apparent with rolling-element bearings, journal bearings, gears and cylinders. Erosion wear is another concern with particle ingression. It happens when material loss occurs, and solid particles rapidly strike the component surfaces. Erosion wear mainly becomes an issue in hydraulic systems. Chemical wear or etching is the result of a reactive environment taking place at the surface level. It is caused by combustion byproducts, hydrogen sulfide, bacteria, salts and other factors. This type of wear can appear on many different components and applications, depending on the environmental surroundings. Surface fatigue also acts as a supplier to particle contamination. This undesired evolution is the result of repeated loading over time, which leads to pitting and flaking of the component surface. Surface or contact fatigue is most prevalent on the mesh point of gear teeth as well as other rolling friction surfaces. In addition, particle contamination can affect the rate of additive depletion. Additives become a limited resource for protection, as they are designed to be sacrificial in nature while adhering to surfaces or contaminant particles. As the additive count begins to diminish, fewer particles can be eliminated, and component surfaces are inadequately shielded. Contamination then becomes a greater threat. Among the strategies for eliminating or minimizing particle contamination, hardware modifications and component modifications are two available options. Modifying lubrication hardware can have an immediate impact on particle contamination and often comes in the form of breathers and filters. When selecting a filter, several factors should be taken into account, such as the location, configuration, operating pressure, beta ratio, micron size and flow rate. Breathers present another form of protection if properly outfitted. When choosing a breather, consider the pressure in the housing or reservoir, fill port clearance and exposure to the environment. Component modifications can also minimize particle contamination. Several elements should be evaluated, including the reservoir access points, system pressure and bearing type. While reservoirs are ideal for visually inspecting the lubricant on a large scale, seals and hatches are often left open, allowing external particles to gain access to the system. Ensuring that hatches are properly sealed and modifying existing access points that have a poor design configuration can dramatically reduce particle ingression. It also is important to assess the system pressure, as positive pressure on a tank or reservoir can serve as a deterrent against airborne particles. Another option would be the addition of magnetic or electrostatic separators to remove ferrous and opposite-charged particles. One final consideration is the bearing and motor selection. Utilizing sealed or shielded bearings and enclosed motors can help to minimize particle contamination in certain applications. Dispersing heat is a primary function of a lubricant. Therefore, temperature plays a critical role in a lubricant’s physical characteristics. Lubricants that must cope with substantial temperature fluctuations over time tend to have a reduced life cycle. When lubricants function at the edge of their operating temperature range, several issues may arise. The most prominent complications are thermal degradation, oxidation, varnish and film strength deprivation. On the high end of the temperature spectrum, viscosity will be affected with a thinning of the base oil. This can also lead to acidic accumulation, sludge and varnish through weak oxidation stability. These issues can result in flow restriction or starvation along with restricted component movement. Lower temperatures impact viscosity as well, negatively altering the flow rate properties of certain lubricants. To limit temperature-related issues in a lubrication system, it is best to evaluate your lubricant options and component modifications. Re-examine the current oil or grease in systems that have concerns of recurring failures. Ensure the viscosity of the oil or consistency of the grease is appropriate for the system. The correct oil level or lubricant amount is key as well. Reservoirs with oil level indicators that are out of range or bearings with too little or too much grease often operate with temperature anomalies. This information can be checked through sight glasses and level gauges for oil or ultrasound technology for grease applications. Using a synthetic lubricant is another option. Synthetics commonly offer higher viscosity indexes for dealing with a wider temperature range. Also, be sure the correct type of bearing is utilized for the particular application. While there is some overlap between oil-filled vs. grease-filled bearings, it is important the correct decision has been made. When evaluating between the two, consider speed, location, environment, contamination level and local temperature. Most sampled lubricants have some amount of moisture. If moisture is allowed to increase, it can lead to failure. Moisture accumulates in a lubricant through several mechanisms, such as handling, storage and general use in the system. It is worth noting that moisture appears in three distinct forms: free, dissolved and emulsified. The most common problems related to moisture are additive depletion, hydrolysis, cavitation wear and water-washing. Additive depletion occurs due to excess water contamination soaking up polar additives. The process of hydrolysis arises through the breakdown of base oils and some associated additives, thus accelerating the oxidation process. Cavitation wear is activated through pressure increases in the lubricant when moisture is present. As cavitation takes place, it can cause damage to exposed surfaces. Water-washing presents failure concerns in both grease and oil. Grease water-washing tends to happen through direct contact of water spray with a bearing. In oils, moisture ingression through water-washing typically occurs through the seals. Hardware modifications, lubricant changeouts and component alterations can all be employed to eliminate moisture. Just like with particle contamination, the installation of suitable breathers and filters can also help to address moisture contamination. Again, it is important to understand the parameters of your equipment when selecting filters and breathers. Bottom sediment and water (BS&W) bowls are another good option for identifying and removing moisture. One thing to consider with BS&W bowls is that you are not preventing moisture from entering the system but simply addressing it once it is already present. Vacuum dehydrators and dialysis equipment are other alternatives that can aid in the elimination of moisture currently in the system. A lubricant-related strategy would include using a lubricant with high demulsibility properties. This exploits the oil’s ability to separate from water, thus making it easier to remove moisture from the system. Reservoir containment, headspace flow, sealed bearings and enclosed motor applications are among the various component strategies. Creating headspace flow will minimize humidity, draw moisture from the lubricant and aid in the prevention of condensation in the reservoir. 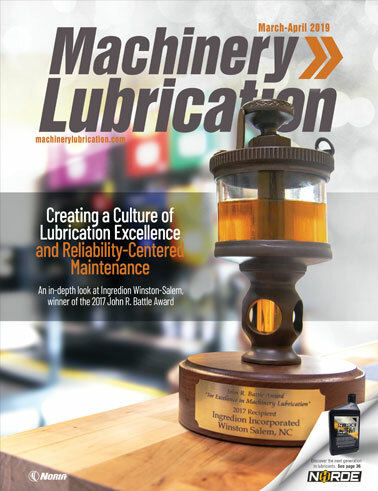 As you begin to understand the different lubrication failure modes, including why they occur, how they affect lubricants and how you can mitigate or eliminate them, a culture change should begin to take place with new installations and equipment overhauls. Although this is not a quick process, like most successful initiatives, it should pay off over time. Eventually, maintenance personnel should see their repetitive task load begin to shrink, and those lingering PM backlogs will be reduced. Neale, M.J. (1973). “The Tribology Handbook.” Woburn, MA: Butterworth Heinemann. Scott R., Fitch, J.C., & Leugner, L. (2012). “The Practical Handbook of Machinery Lubrication.” Tulsa, OK: Noria Corporation.